3D shape shading art photo thing! I don't know what I'm supposed to call this art. 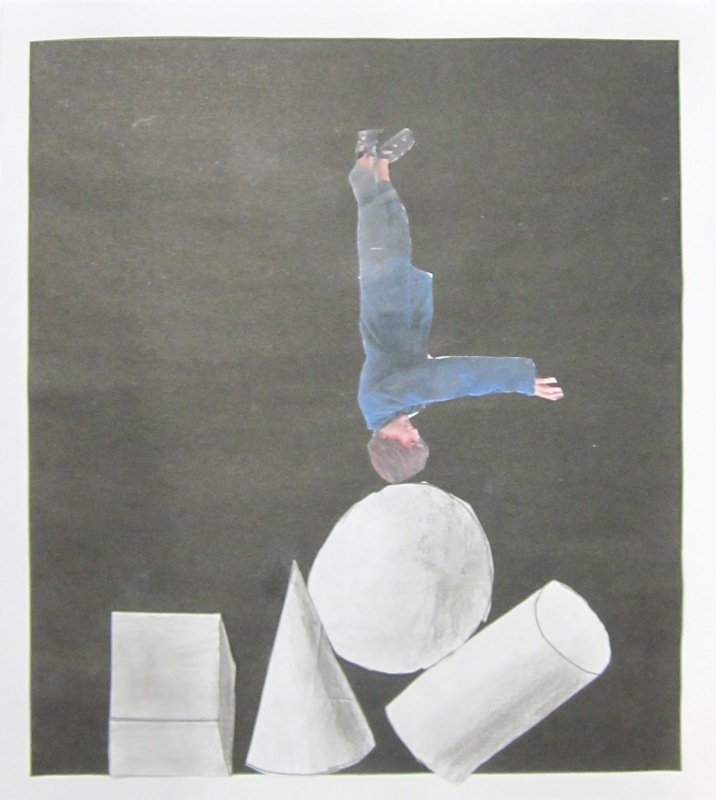 So I'm gonna call this particular piece (wot wot) "Nobody likes physics." Slightly ironic, considering the incredibly realistic physics shown in the artwork. Anyway, we were learning to shade 3D shapes to show a light source. This was quite hard and has now made me hate cubes. "Oh, you want to draw me Calvin? Okay, OH WAIT I'M GOING TO LOOK TERRIBLE AND ANNOY YOU TO THE END OF TIME! MWAHAHAHAHAHAHAHA!" 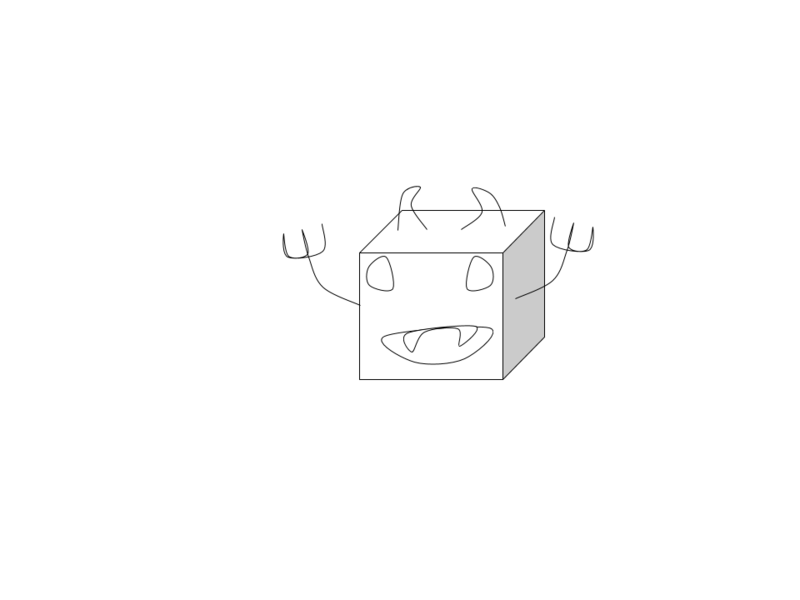 So I had to draw the cube multiple times just to get it looking okay. My next step is to learn how to draw cubes. So this is a narrative plan with 3 columns. Yup. Doesn't have a name so I'm gonna call it the trubblerectanglemap. We were learning to take a character from a book and expand on that character, making it's own story. This was FUN. I didn't initially choose this character, but we don't talk about the first character. This character however... this character isn't too important to the plot, only really appears in two parts and in between those parts it's not explained how he got there. Perfect. I could make up an ancient Arabian mafia, a cabbage rescue mission, I could've even made him go to the moon*! So overall, this was EASY! It's gonna be published soon too. My next step is to publish this. *I didn't though :( . Blueberries. 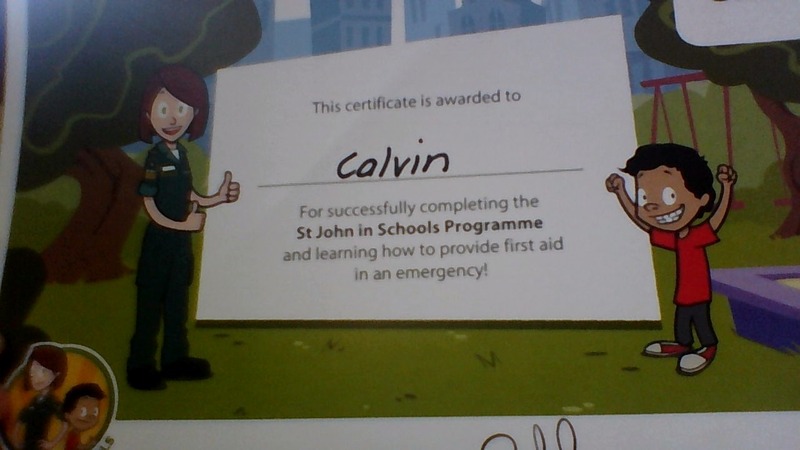 This certificate is for the almighty SAINT JOHN IN SCHOOLS PROGRAM! 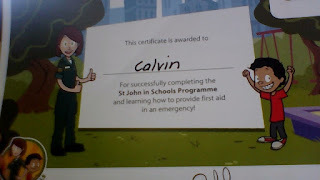 The picture is slightly weird, I mean, where did they get that massive piece of paper? Maybe they had some excess bandages. And if I was slightly better at taking pictures then you would see the impossible sand castle*. Anyway, I am a doctor now. Yay. *It's got sticking out bits! Made of yellow sand! Yellow sand can't hold it's shape, you need wet sand that's dried out in that shape! Pomegranates! 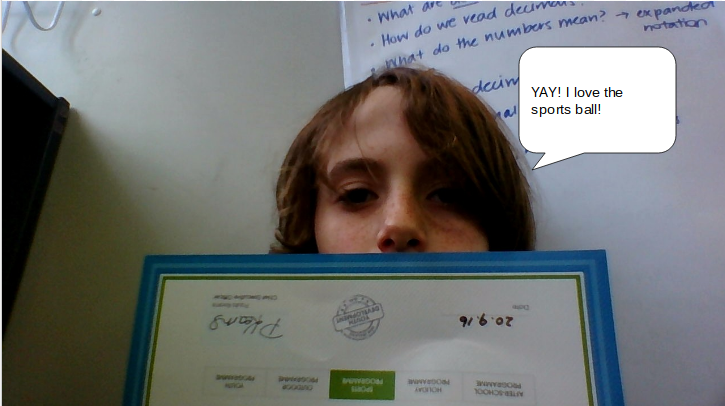 This is a photo of me and my Youthtown certificate. As you can see, I am very enthusiastic about the sports. I'm a big fan of the Rogbee game. I love the running at the other people and the sitting on them until they give you the ball. I also love the attacking of the earth with the ball. Youthtown also had some of the sports games which were of the fun. There was the Hokkey game and the Biscutball game. I was learning to make a haiku. I had to do it about something in nature. So I did winter, because penguins and Snowman Steve*. I found this work tricky because how many words are there for ice? It was originally supposed to be about antartica, but people thought it was about winter so I just pretended it was about that all along. My next step is to create a detailed backstory for snowman steve. Oh yeah, and do a haiku about something I´ve never heard of. I´m not really sure what we were learning about this. Like, we were talking about how Meg in A Wrinkle In Time has a rebellious personality and Mrs Borcher (Google wanted to call her Mrs Scorcher) gave us this activity. I found this slightly tricky because I don´t like talking about my personality. It just seems kinda vain to me. Draw the skyline of Auckland on black paper. It is crucial that you do this badly. Cut out the skyline. This must also be done terribly. Sponge paint the water. Make sure the paper folds over and gets blue on your lovely sunset. Glue the skyline on to the paper so that all the tops of the buildings stick out. This was actually quite easy though. Draw the skyline of Auckland on black paper. It's easier if you make the buildings very wide. Cut out the skyline. This is why it's easier if the building are very wide. Paint the water by dipping a small sponge in paint and squishing it against the paper. Glue the skyline onto the paper. Anyway, my next step is to learn how to draw. And cut.